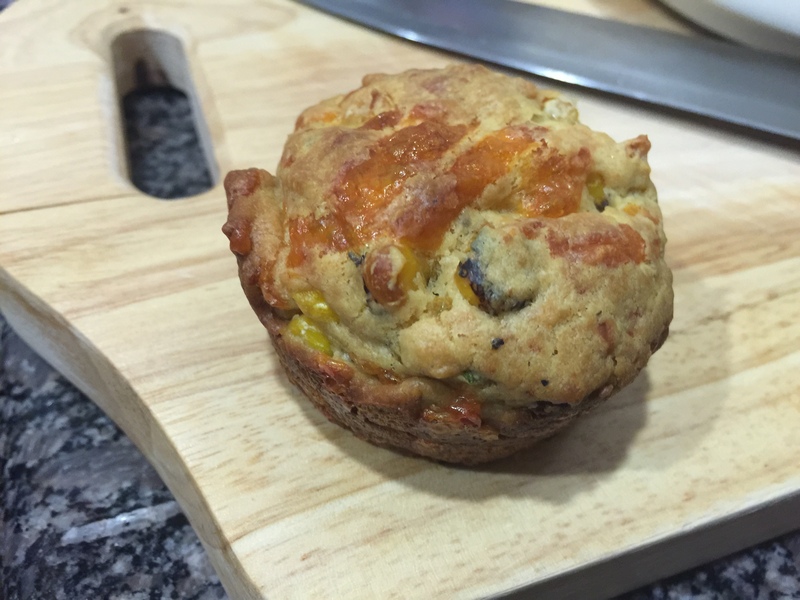 Recipe: Corn and Cheese Muffins. – Recipes & Food Writings. Muffins are normally thought of as something sweet, more than likely with fruit and is great for breakfast or as a quick snack. Well, for those of you who want a savory muffin, I have a recipe for you! 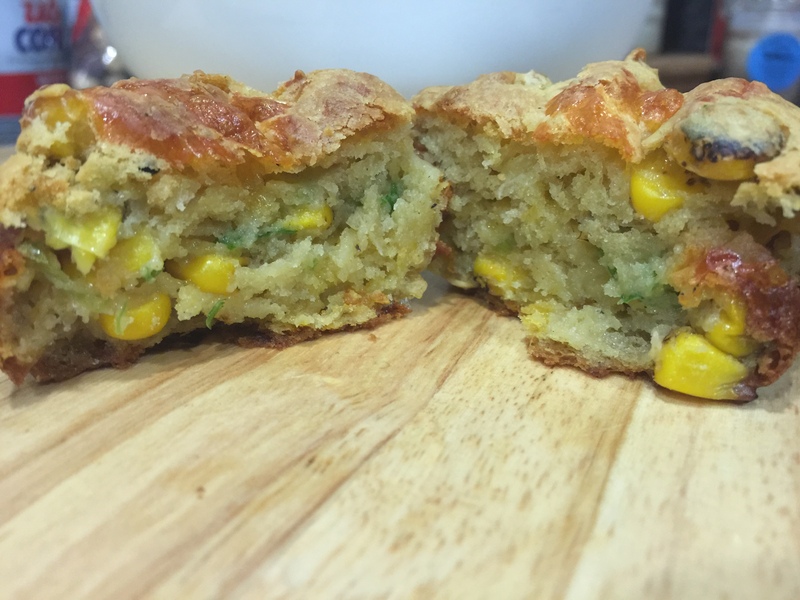 What inspired me for this recipe is the fact that when you search for a corn muffin recipe online, you can easily get recipes with cornmeal in it. Sometimes, I don’t want the gritty texture! So, after tinkering around in the kitchen I came up with this! 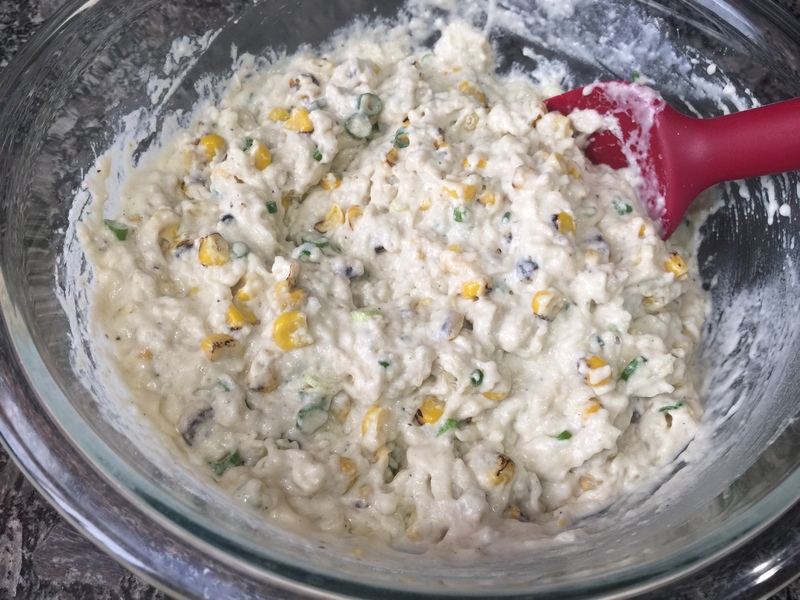 For the recipe, you’ll need flour, baking powder, baking soda, salt, black pepper, an egg, shredded cheese, green onions (scallions), milk, melted butter, and corn. For the corn, you can use any kind of corn that you wish. It can be frozen, canned, or fresh. It can be roasted or not. It can be yellow corn or white corn. For this batch of muffins, I used the fire roasted yellow corn that I got in the freezer section of Trader Joe’s. Just don’t use the creamed corn because that would make the batter too runny. 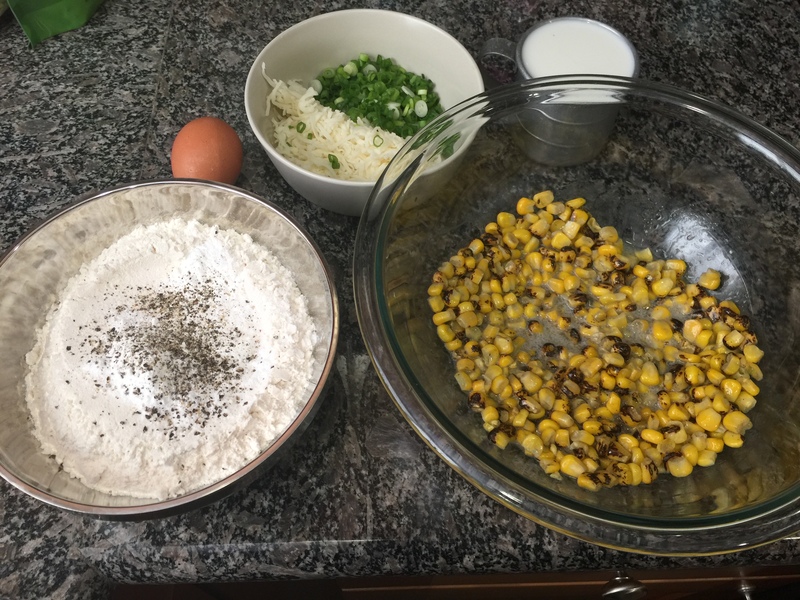 In a large mixing bowl, combine the wet ingredients – including the corn, sliced scallions, and cheese. The cheese can be any type of cheese that you want! I used white cheddar for this recipe, but you could use any type of cheddar. Or even pepper jack, colby, monterey jack, or mozzarella! Once the wet ingredients are well combined, add in the dry ingredients. Mix well until there are no pockets of dry flour left in the bowl. The best part about this recipe is that it makes 12 muffins exactly. So you don’t have to worry about the muffin tins being overfilled or having some extra leftover for an oddly small muffin. So place about 2 heaping tablespoons of the batter into each tin, then let them bake until golden brown. 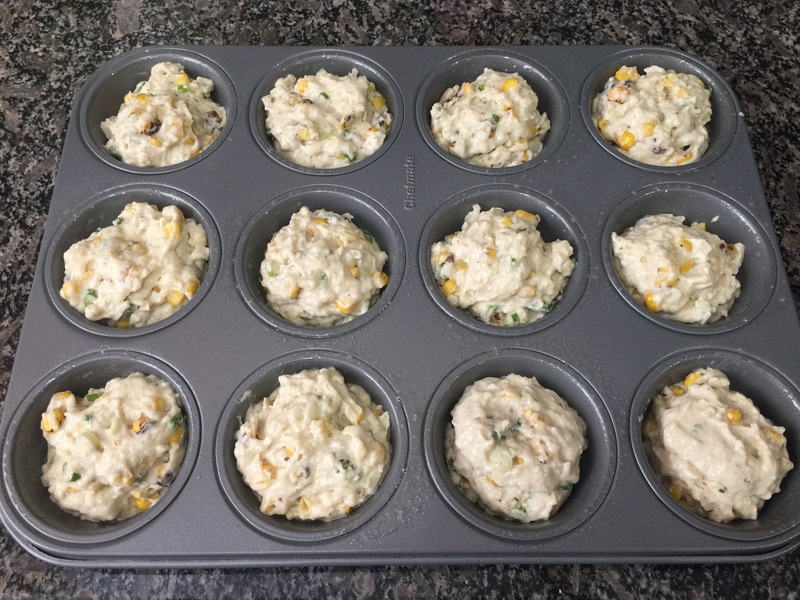 Spray a 12-cup muffin tin with non-stick spray and set aside. In a small bowl, combine the flour, baking powder, baking soda, salt, and black pepper. Set aside. 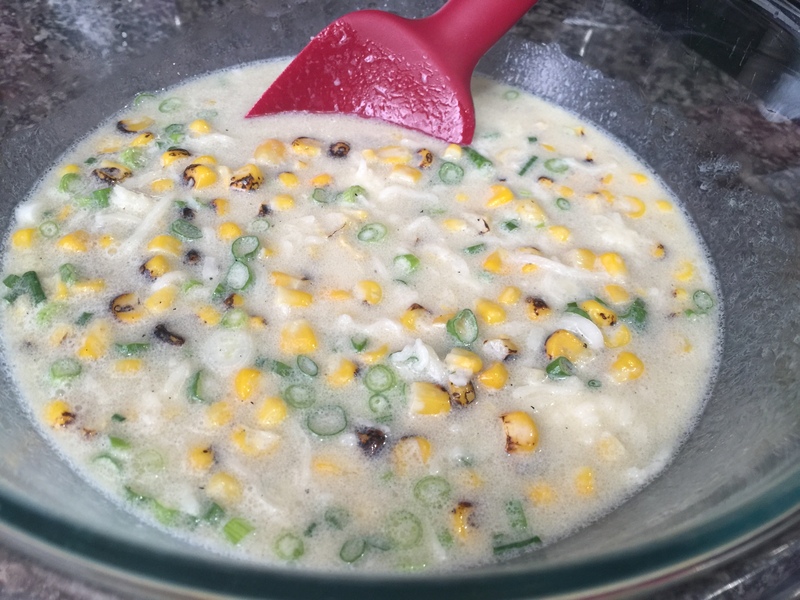 In a large mixing bowl, combine the melted butter, egg, milk, cheese, corn, and green onions. Mix until well combined. Add the dry ingredients into the wet, mixing until just combined and there are no dry streaks of flour in the batter. Place 2 heaping tablespoons into each cup of the prepared tin. Put the pan onto a rack in the center of the oven and let it bake for 35 minutes. When done, the muffins should be golden brown and spring back easily when the top is touched. This can be eaten for breakfast, perhaps even on the side with soup or chili for dinner. If you want this spicy, you can always add some cayenne pepper to the mix, or add some fresh diced jalapeno or serrano peppers. And if you want to get really crazy, you can add some crisped up bacon or browned sausage to the batter before baking as well.